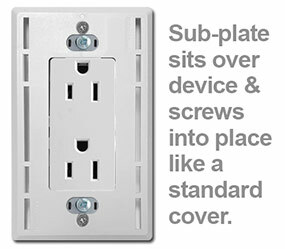 Shop screwless wall plates for updating your home with a modern look. 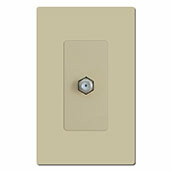 Find screw-less plastic switch plates (which actually have hidden screws) in a variety of solid color and metallic finishes by Lutron, Legrand, and Touch-Plate to use with matching electrical switches and outlets. 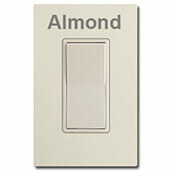 You'll love the modern elegance of smooth, plastic light switch plate and outlet covers with no visible screws. Simply screw in a subplate, then the finishing cover snaps into place. We cary Lutron, Touch Plate and Pass & Seymour Legrand screwless covers that fit Decora rocker switches, rocker shaped & slider dimmers, block outlets, GFCI outlets and rocker shaped inserts. 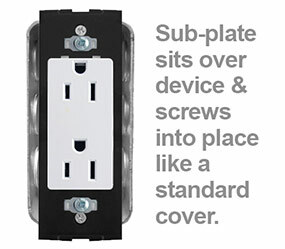 Lutron's covers snap into the sub-plate, rather than over it, which is why they are the smallest of the screwless cover plates. The subplates have the same dimensions as the outer covers, so you'll see the seam between the top and bottom plates from the sides once installed. 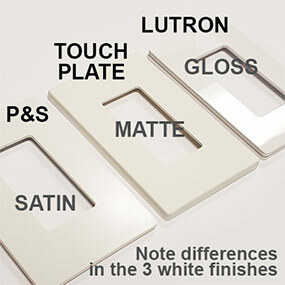 With the exception of the Satin Black and Satin Red, Lutron's plates are high gloss. Lutron sub-plates install over device. 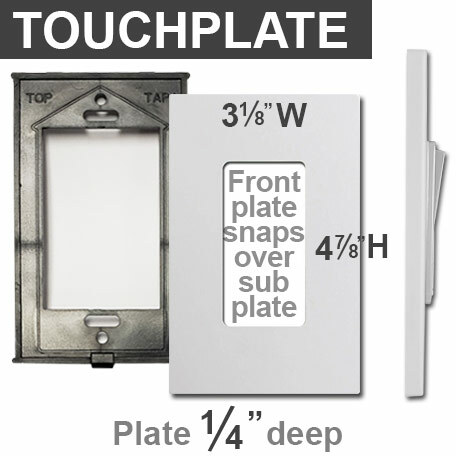 Touch Plate covers are slightly larger that Lutron's. They can be used with any rocker device, but they're made to cover Touch Plate's line of Ultra low voltage light switches. The subplate doesn't show once the outer cover is snapped over it. These covers have smooth, seamless edges & a matte finish with no shine. Touch Plate Ultra sub-plates install under the device. You will need to cut the power to the device, then remove the device from the box and feed it through the sub-plate. Use the device's screws to attach both the sub-plate and the device to the box. Snap the screwless cover onto the subplate before restoring power to the device. Pass & Seymour's screwless plates have the smallest subplates. The outside plate is the largest between the 3 brands and snaps over the sub-plate entirely reaching all the way back to the wall. P&S's covers taper and have a seam around the edges, which can be seen from the side. The subplate, however, doesn't show. These have a satin finish - more reflective than the matte Touch Plate cover, but not as high-shine as Lutron's gloss covers. Pass & Seymour Legrand sub-plates install over device. 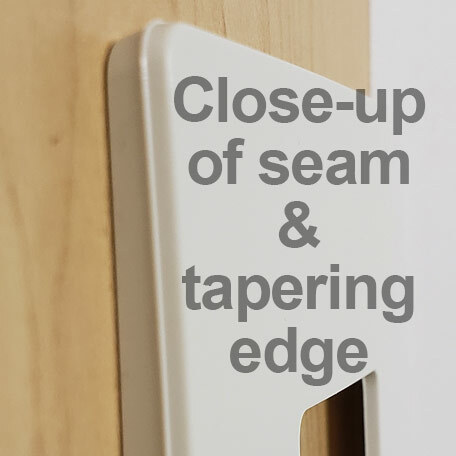 See how the P&S covers taper back towards the wall and have a visible seam. Not only are all 3 brands different sizes, they also have different sheens and varying shades of white. Lutron covers are glossy, Pass & Seymour's are satin and Touch Plate's are matte. 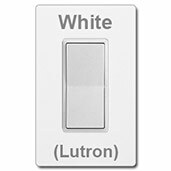 Lutron's white is the brightest, Touch Plate's white finish is the darkest, and P&S's white is in-between the other two. Lutron makes inserts that allow other devices that don't typically fit rocker openings to be covered by screwless covers, like this cable tv jack. 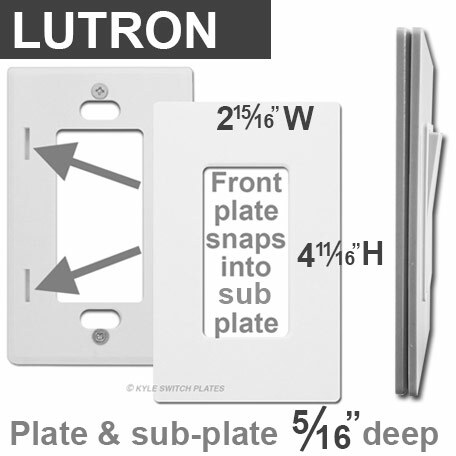 Lutron inserts are a perfect match in finish to their line of screwlss wall plates. 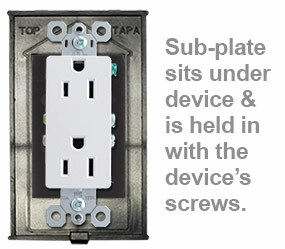 Here you can see the Lutron phone jack insert for screwless covers. Use a blank rocker insert if you need one of your screwless plate openings to have no cutout. Finishes vary. 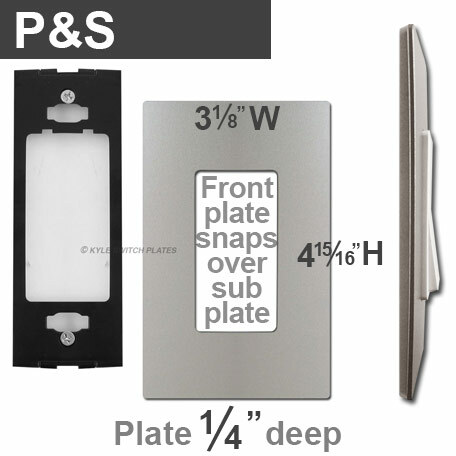 To compare finishes, here are examples of each screw-free cover plate shown with a Pass & Seymour Rocker Switch. 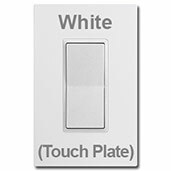 Touch Plate's white screwless covers are a great match to Pass & Seymour's white rocker switch. 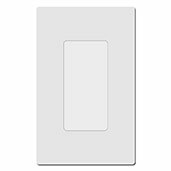 White screwless plates from Lutron are a brighter white than this rocker switch. Touch Plate's almond finish is slightly more yellow than this P&S rocker which, which has a redder tone in comparison. 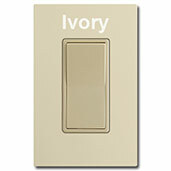 Touch Plate's ivory rocker plate is a good match for P&S's ivory light switch & they work well together even though the switch itself is darker than the cover. 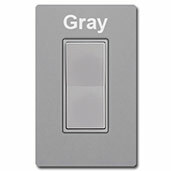 Lutron's gray light switch covers are a little darker and slightly bluer than the Pass & Seymour switch in gray. 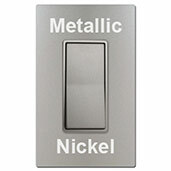 Nickel switches, outlets & dimmers are best for pairing with Pass & Seymour's Legrand metallic nickel covers. Lutron's brown switchplate is a good match for this brown Pass & Seymour rocker switch. 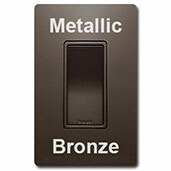 The best devices for screwless metallic bronze wall plates are bronze electrical devices. 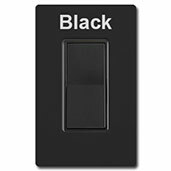 Lutron's screwless switchplate in black is a great match for Pass & Seymour's black rocker light switch. 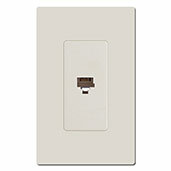 Match white, brown, gray, ivory and black covers with coordinating electrical devices here. You can get a blending or contrasting color or find a finish that matches other accent pieces in the room, such as trim, wall color, a rug or furniture.